Sales revenue is the income received by a company from its sales of goods or the provision of services. In accounting, the terms “sales” and “revenue” can be used interchangeably and mean the same thing. It is important to note that revenue does not necessarily mean cash received. A portion of sales revenue may be paid in cash and a portion may be paid on credit, through terms such as accounts receivables. Sales revenue can be listed on the income statement as either the gross revenue amount or net revenue. Net revenue includes all deductions for the return of goods, the possibility of undeliverable merchandise and the expense for unrecoverable accounts receivables (also known as bad debt expense, which flows into the balance sheet as the allowance for doubtful accounts). Gross revenue, on the other hand, does not include these deductions. The gross revenue presentation will have the deductions below gross revenue, and a subtotal for net revenue below that. The very first line of the income statement is sales revenue. This is important for two reasons. Firstly, it begins the starting point for arriving at net income. From revenue, cost of goods sold is deducted to find gross profit.Gross ProfitGross profit is the direct profit left over after deducting the cost of goods sold or cost of sales from sales revenue. It's used to calculate the gross profit margin and is the initial profit figure listed on a company's income statement. Gross profit is calculated before operating profit or net profit. Depreciation and SG&A expensesSG&ASG&A includes all non-production expenses incurred by a company in any given period. This includes expenses such as rent, advertising, marketing, accounting, litigation, travel, meals, management salaries, bonuses, and more. On occasion, it may also include depreciation expense are deducted from gross profit to find the operating margin, also known as EBITEBIT GuideEBIT stands for Earnings Before Interest and Taxes and is one of the last subtotals in the income statement before net income. EBIT is also sometimes referred to as operating income and is called this because it's found by deducting all operating expenses (production and non-production costs) from sales revenue.. EBIT less interest expenseInterest ExpenseInterest expense arises out of a company that finances through debt or capital leases. Interest is found in the income statement, but can also be calculated through the debt schedule. The schedule should outline all the major pieces of debt a company has on its balance sheet, and calculate interest by multiplying the is pre-tax income, and pre-tax income minus taxes is net income. Secondly, as the first item of the income statement, sales revenue is an important line item in the top-down approach of forecasting the income statement. The historic trend of revenue is analyzed, and revenue for future periods are forecasted. From there, all expenses below sales revenue are often found as percentages of that revenue. As the first item, it becomes the pivot or anchor from which other line items can be forecasted. This is also one of the reasons why sales revenue is known as the “top line”. 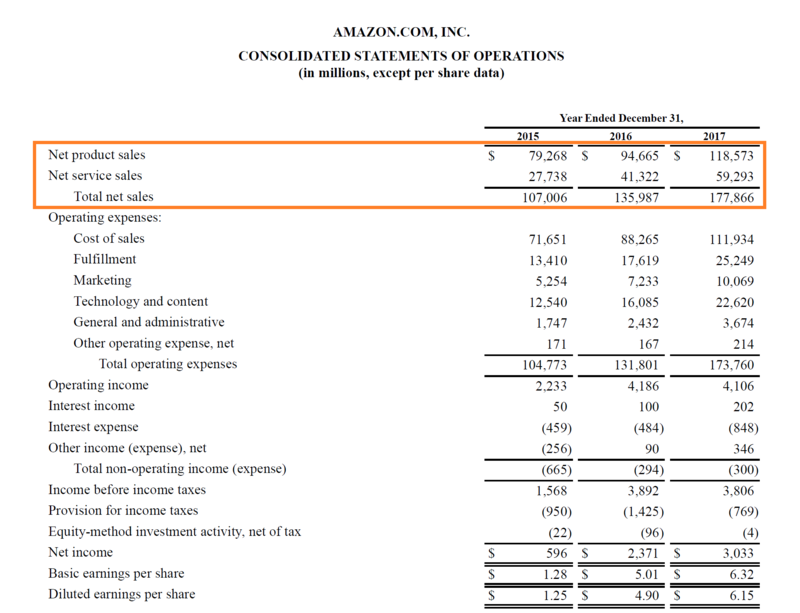 Below is an example from Amazon’s 2017 annual report (10-k10-KForm 10-K is a detailed annual report that is required to be submitted to the U.S. Securities and Exchange Commission (SEC). The filing provides a comprehensive summary of a company’s performance for the year. It is more detailed than the annual report that is sent to shareholders) which shows a breakdown of its sales according to products and services. In 2017, Amazon has net sales of $119 billion from products and $59 billion from services, for a combined total of $178 billion. As you can see, this forms the top of the income statement, and all expenses and profits or losses are located below.